McKee's 37 Xtreme Foam Formula Auto Shampoo, 8 oz. Formulated for foam guns and foam cannons. Does more foam create a cleaner vehicle? It does if it comes from McKee's 37 Xtreme Foam Formula Auto Shampoo. This high yield foaming auto shampoo bursts into mounds of suds when introduced to water and agitated. The bubbles work to encapsulate oily residue and dirt even before your mitt touches the paint. This rich foam - combined with our own advanced cleaning agent- leaves your vehicle looking and feeling fantastically clean and bright. When blasted through a foam gun, McKee's 37 Xtreme Foam Formula is at its best because it’s the only car shampoo formulated for foam guns. The high soap to water ratio produced by a foam gun allows this intense shampoo to produce FROTHY FOAM unlike any shampoo you’ve used before. The high viscosity of McKee's 37 Xtreme Foam Formula allows the suds to cling to the vehicle in order to begin grabbing dirt and oil on contact. With the help of a soft, clean sponge or mitt, you’ll achieve an Xtreme clean with this super-sudsing car wash.
A lot of soaps can clean, but they can’t leave the kind of shiny, smooth finish created by McKee's 37 Xtreme Foam Formula. McKee's 37 proprietary cleaning agent builds thick, multi-tiered bubbles that work to lift dirt and grime off the surface of the vehicle. Though it contains effective cleaning agents, McKee's 37 Xtreme Foam Formula is pH-balanced to retain the existing paint protection. McKee's 37 Xtreme Foam Formula leaves waxes and sealants intact while removing the dirt and debris that hide your vehicle’s shine. 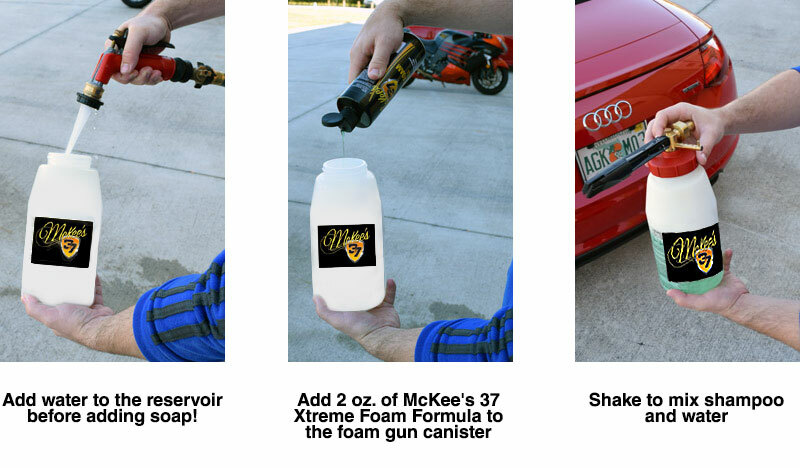 McKee's 37 Xtreme Foam Formula maximizes the performance of foam guns and foam cannons. Water softeners in McKee's 37 Xtreme Foam Formula help offset the effects of hard water so your vehicle dries with fewer water spots. These softening agents also allow the shampoo to achieve its full foaming potential. Since most swirls are introduced during the wash process, our rich, foam formula contains an xtreme amount of lubricants and beneficial oils. These lubricants wrap around dirt and suspend it just above the paint surface, where it cannot scratch the paint. The oils nourish the paint to deepen the color and enhance the shine. McKee's 37 Xtreme Foam Formula has a clean, fresh mint fragrance plus a bright green color to compliment its fluffy, white suds. CLEAN looks and smells like this. Enjoy the rich, fragrant lather of McKee's 37 Xtreme Foam Formula in your foam gun or wash bucket. Pour two ounces of Xtreme into the foam gun’s reservoir after filling it with 6-8 ounces of water. Shake well for maximum foam. Set the multi-ratio stem to the maximum foam output, which is the last notch. Note: the McKee's 37 Foam Gun features a quick connect between the hose nozzle and foam gun’s lid. Filling and shaking the foam gun is easier if you release this quick connect. Turn the water on and coat the vehicle in foam, one section at a time. You can pre-soak the vehicle and then follow up with your wash mitt or follow along with your mitt as you spray the vehicle. Either method is effective. Wash from the top of the vehicle down and rinse your mitt often to prevent swirls. Rinse the vehicle often. Once the vehicle is washed and rinsed, dry it with a Cobra Guzzler Microfiber Waffle Weave Drying Towel to prevent water spots. Pour 2-3 ounces of Xtreme into a 5 gallon wash bucket, such as the McKee’s 37 5 Gallon Wash Bucket Combo. Activate foam with a strong jet of water. Wash the vehicle as directed above. Rinse and towel dry. McKee's 37 Xtreme Foam Formula 128 oz. McKee's 37 Xtreme Foam Bucket Kit Mega Value!